Queensland state schools will apparently be condemned to languish at less than 90 percent of the schooling resource standard for the next five years under a federal government funding arrangement signed between the state and federal governments yesterday. A technical briefing will be provided to all stakeholders later this afternoon and more detail will be known then, including the reform commitments Queensland has been required to adopt to secure less than minimum funding for Queensland schools. It does appear that the unacceptable requirements of the federal government’s ‘reform’ agenda have not been adopted by Queensland but that is subject to confirmation later today. Despite more rhetoric about ‘record’ levels of funding, the minimum funding level set in 2011 is even further off now. The importance of a change of federal government at the next general election has never been greater. reverse the cuts to disability funding. All schools should be funded fairly based on the unique needs of each child. But because of changes by the Liberal-National government in Canberra, state schools are missing out on billions in urgently needed funding. Fair funding would mean: smaller class sizes, more one-on-one support, and additional teachers and support staff. 2018 should have been a year of celebration for our schools with the biggest investment in schools in decades. But the Morrison Government’s $500 million cut to Queensland schools will deny most of our children the benefits of this life changing assistance. However, the Federal Government pushed through legislation last year which means the Commonwealth will provide 80% funding to private schools to meet the Schooling Resource Standard but only provide 20% of funding to public schools. And they are giving hundreds of millions of dollars of capital funding to private schools but giving no capital funding to public schools that desperately need basic classroom building improvements. We must stand up and demand fair funding now. for upgraded classrooms and facilities. 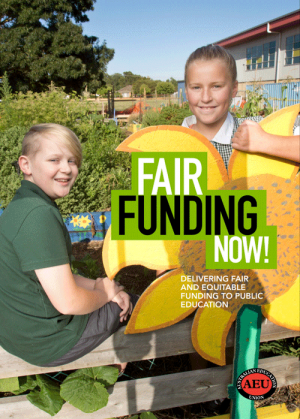 Fair funding now for a fair go for all children. Are you in? Ballot results - Fair Funding Now! The release today of the report of the Review to Achieve Educational Excellence in Australian Schools highlights the gap between rational thought on education and the policies of the Turnbull government.